BATUMI, GEORGIA — A US warship docked in Georgia’s Black Sea port of Batumi Tuesday, the US embassy said, as tensions in the region remain high over Russia’s role in the conflict in Ukraine. 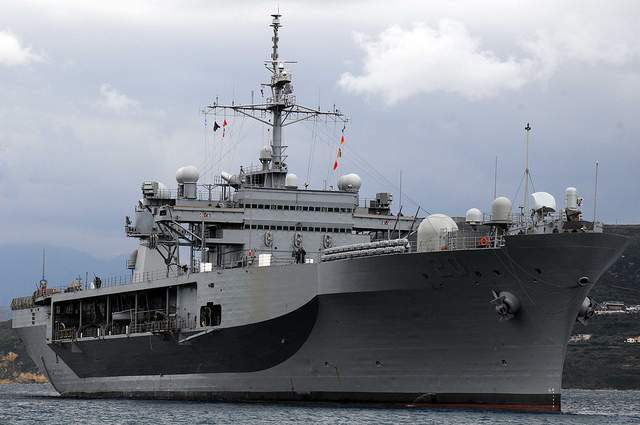 The arrival of the USS Mount Whitney for a five-day visit “reaffirms the United States’ commitment to strengthening ties with NATO allies and partners like Georgia,” the US embassy said in a statement. The flagship of the US Navy 6th Fleet “will conduct routine combined training with the Georgian Coast Guard,” the embassy said. The arrival of the command ship in Georgian waters is the latest of a series of such visits that have infuriated Russia. US warships delivered humanitarian aid to the ex-Soviet state after the Caucasus country fought a brief war with Russia in 2008 and have since then continued making regular calls to Georgian ports. Ukraine’s standoff with Russia has alarmed Tbilisi, which says that six years after its own war with Moscow it is still exposed to a Russian threat.